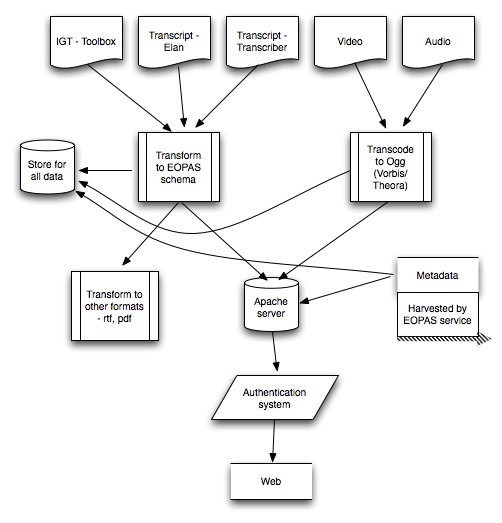 Preparation of an open-source streaming server with time-aligned text: towards a distributed international language museum using EOPAS, the EthnoER online presentation and annotation system. The new EOPAS is now ready. Please see the Using the EOPAS system web page for details on how to use EOPAS and the file format requirements. A working version of the new EOPAS system can be seen at EOPAS website and an example using video can be seen on the Audio Annotations web page. This project provides an open-source framework for delivery of media in an application addressing the problem of how to make language data more generally available than it currently is. While the content of the media to be delivered is scholarly research, the method employed is one that is already being developed for significant data sets elsewhere in the world (eg Metavid), and the users are likely to be both scholars and the general community who have an interest in the diversity of the world's languages. With the development of HTML5 and the availability of the free and open-source media server Annodex, we are seeing the possible uses of broadband-enabled media (audio and video) increase exponentially. This pilot project will first build an open-source installation with the aim of later creating an online network of language collections linking transcripts and media, based in the existing international network of digital language archives and leveraging their collections as the basis for a networked virtual museum of human languages. The textual system on which this is all based, called EOPAS and developed in 2006 under an ARC eResearch grant, has been well received in presentations here and in the USA and the UK. The present project will redevelop this system to take advantage of recent developments in technology. This type of scripting can be used to call the media for lexical citation forms played from a single media file or for arbitrarily long lines of text showing a continuous text called from a single media file. We have set out a series of milestones over 2010 to rebuild the media upload and transcoding module and the text upload and presentation system. There is an open-source and documented system on Sourceforge. The EOPAS development site has mailing lists to keep interested people up to date with the project. If you want to subscribe they will be very low traffic lists, one for announcements and one for developers. Programming will be provided by Silvia Pfeiffer and John Ferlito, CEOs of Vquence and creators of and specialists in the use of Annodex, who will also install the database used in the project. Silvia Pfeiffer has been actively involved in the development of current Web video technologies, she is an invited expert on the W3C HTML, Media Annotations, Media Fragments, and Timed Text working groups and is actively shaping future video standards and technologies. Development of an access module to allow only authenticated users to access data streams.